A Commentary Quartet on Religion & Spirituality. 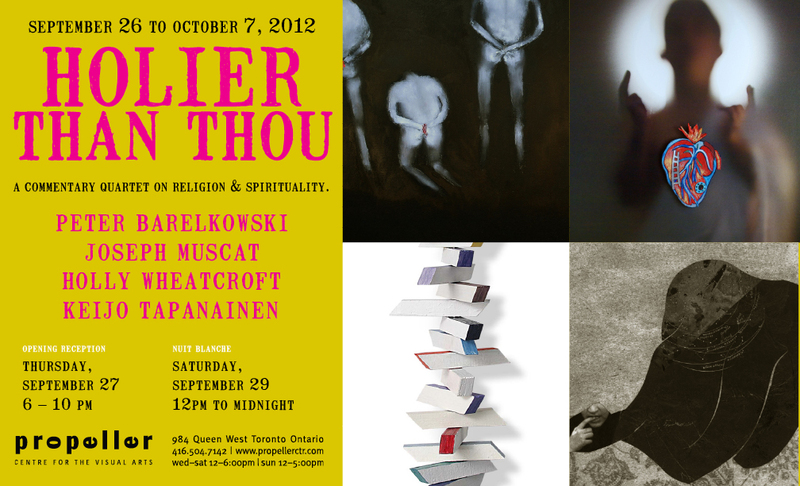 Opening Reception: September 27, 6 – 10 pm. 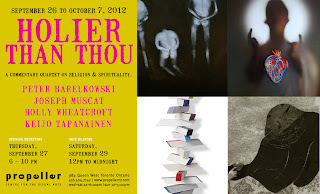 Initiated by Peter Barelkowski and Joseph Muscat, Holier Than Thou is a curated show whose aim is to explore the many layers of belief systems that are prevalent worldwide. The content of the exhibition is intended to provoke, challenge and comment about the various aspects of such belief systems, good, bad or indifferent. Defined by rules, precepts and rubrics, organized belief systems are often premised on exclusivity, preference and privilege. Each of the four artists members of Propeller Centre for the Visual Arts delves into and interprets some of the many aspects of denominational worship and spirituality. The eighteenth century brought us Enlightenment. The old established systems that controlled people over centuries were forced to change, giving way to new, progressive ones. Religious institutions trying to hold on to their power and control were forced to adapt. In the nineteenth century, new secular movements gained momentum and religious institutions, often oppressive and controlling, suffered another setback. At the present dawning of the twenty-first century, religious factions throughout the world seem to be making a comeback. Fundamentalism and Radicalism are once again pushing their way into the politics of many countries wreaking havoc, spreading hate and causing pain and suffering. Throughout it all however, spirituality has been a constant, spreading hope promise and goodwill - an antidote to the often darker side of organized faith.